Increasing cycle mode share for trans-Hudson commutes would allow North Jersey to grow population and jobs without increasing congestion and spending on roads and mass transit. Percentage of income spent on housing and transport. Regional Plan Association. Should a trans-Hudson rail tunnel have to be taken offline for extended repairs, which would significantly disrupt train and bus service throughout the region, a widened GWB will afford residents alternate means to get to work. Note: This will happen for 18 months starting in 2019 when the L-subway is shut down to facilitate East River tunnel repairs. Each bike trip offsets the emissions of one car trip, which will help the region realize its goal of reducing greenhouse gas emissions 80% by 2050. GHG emission reduction goals. Regional Plan Association. By enhancing rural economies, cycle tourism reduces the need to convert open space for development.6 Access to good cycling facilities creates more livable streets and enhances resident opportunities for exercise and recreation. Modes of travel to work. Regional Plan Association. Gateway and a new bus terminal are billions of dollars and decades away from impacting the region, but elements of a wider GWB can be online as soon as 2021, and at very low cost. 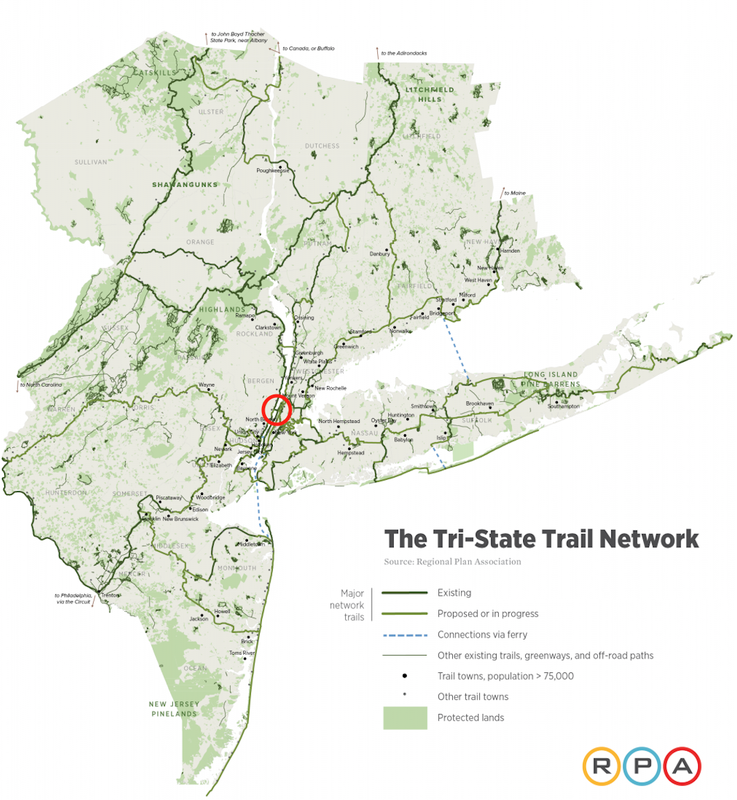 1650 Tri-State Trail Network with GWB circled in red. Image RPA.